We planted parsnips for the first time this year, on the theory that we had known success with every other root vegetable. The parsnips are a happy sight, their greens growing tall (greens are toxic, sadly) and flourishing beneath the soil as well. They’re not an uber vegetable, like kale – one blogger called parsnips “an ingenue waiting to be discovered in this country” — but they’re a good source of potassium, vitamin C and fiber. Our crop is the varietal Harris Model, from Jung. I love parsnips as a component of a roasted vegetable medley: beets, carrots, onions, sweet potatoes, and parsnips. Roasted slowly, the natural sugars come out and create a multi-colored dish that I can make an entire meal of. But that’s a little johnny-one-note, and we’ve already had several rounds of roasted veg this summer. So I started looking around for other parsnip recipes. My mom used to cut them in half and sauté them in butter until they were crisp around the edges, sprinkled with a little salt and pepper. A yummy memory from my childhood. If you have a favorite parsnip recipe, send it along! I found several parsnip soup recipes that looked appealing. Parsnips were the dominant item, but some called for a potato, a sweet potato, carrots or leeks. I decided to go the potato route to preserve the bright white color. Saute the onion in a little knob of butter, 1-2 Tablespoons, in your soup pot. When it’s softened, add the garlic and sauté for another minute or two. Then add the parsnips and potatoes, and a mixture of chicken stock and water, just enough to cover the vegetables. Bring to a boil, cover, and simmer til tender, 25-30 minutes. Puree the mixture in batches in a food processor, or use your immersion blender in the pot. Puree until very smooth (this will diminish any fibrous bits of parsnip). Add ½ c half-and-half or milk for creaminess. If it’s still too thick, add a little more stock. Season with salt, pepper and a dash of cayenne. Reheat to desired temp. Serve in bowls, topped with a sprinkle of minced chives. Or a scattering of bacon bits, for a slightly heartier dish. Serves 2 as a meal, 4 as an appetizer. 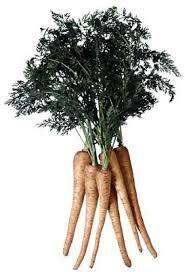 I have never grown parsnips, but from your description, I believe that I will give them a try next summer. Thanks for the information.